This is part 4 of the teachings on the Uttaratantra Shastra. Teaching of 17-Feb-2009: The seventh vajra point. Mipham gsung 'bum p.494-500, verses 279-290. Teaching of 18-Feb-2009: The analogy of Indra. Mipham gsung 'bum p.500-505, verses 291-305. Teaching of 19-Feb-2009: The analogy of the drum. Mipham gsung 'bum p.505-511, verses 306-319. Teaching of 20-Feb-2009: The analogy of the clouds. Mipham gsung 'bum p.511-517, verses 320-334. Teaching of 21-Feb-2009: The analogy of Brahma. Mipham gsung 'bum p.517-521, verses 335-342. Teaching of 22-Feb-2009: The analogy of the sun. Mipham gsung 'bum p.521-526, verses 335-352. Teaching of 03-Mar-2009: The analogy of the precious jewel. Mipham gsung 'bum p.526-532, verses 353-369. Teaching of 04-Mar-2009: The themes of the section, how the activity is without effort. Mipham gsung 'bum p.532-537, verses 353-384. Teaching of 05-Mar-2009: The benefits. Mipham gsung 'bum p.537-543, verses 377-386. Note: Numbering of verses from this chapter onwards follows Dzongsar Khyentse Rinpoche's version, which has an offset of eight compared to the numbering from last teaching. Teaching of 06-Mar-2009: Having the four points of hearing, contemplating, meditating and having aspiration to them not only ensures that a Bodhisattva doesn't get discouraged on the path, it also is a means to generate all the accumulations of merit and wisdom. Mipham gsung 'bum p.543-548, verses 387-395. Teaching of 07-Mar-2009: A warning not to misinterpret or manipulate the words of the buddha. Mipham gsung 'bum p.548-552, verses 396-400. Teaching of 08-Mar-2009: The dedication. This teachings concludes the teachings on Mipham Rinpoche's commentary on the Uttaratantra Shastra. Mipham gsung 'bum p.552-556, verses 401-404. 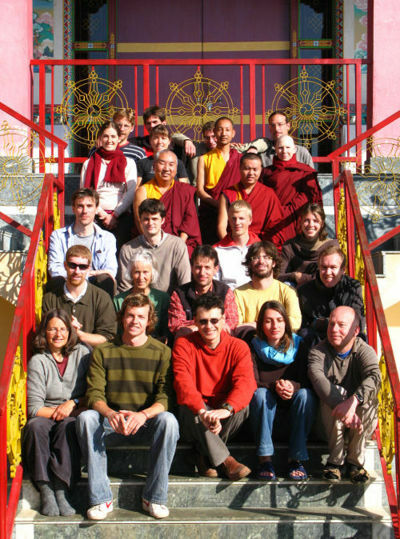 The Shedra is now being concluded with a one-month closed retreat here in Pharping / Nepal. This page was last edited on 28 July 2015, at 11:21.